Medicalisation is the misclassification of non-medical problems as medical problems. A common form of medicalisation is the misclassification of normal distress as a mental disorder (usually a mood disorder). Suicide is medicalised when it is considered a medical diagnosis per se, when it is considered to be secondary to a mental disorder when no mental disorder is present, and when no mental disorder is present but the management of suicidal behaviour associated with distress is believed to be the sole responsibility of mental health professionals. In the West, psychological autopsies have led to the belief that all or almost all suicide is the result of mental disorder. However, there are reservations about the scientific status of such studies. The actions of psychological autopsy researchers, coroners/magistrates, police, policy writers, and grieving relatives all contribute. 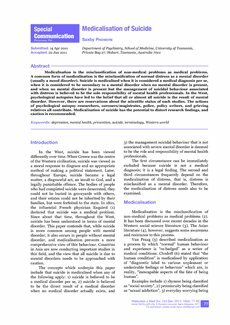 Medicalisation of suicide has the potential to distort research findings, and caution is recommended.